A duo of hibiscus flowers shade this tropically-themed wedding invitation, a wonderful choice for a tropical island or destination wedding. 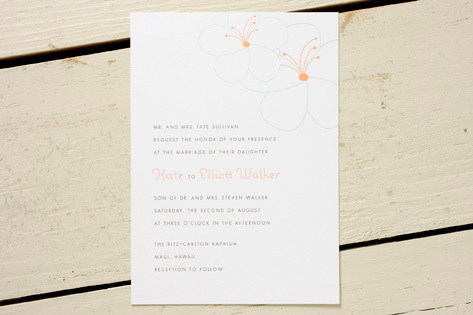 A pop of orange in the center of the flowers gives this invitation extra pizazz. Available in pool blue/poppy orange (shown), sage green/poppy orange, and medium pink/poppy orange.